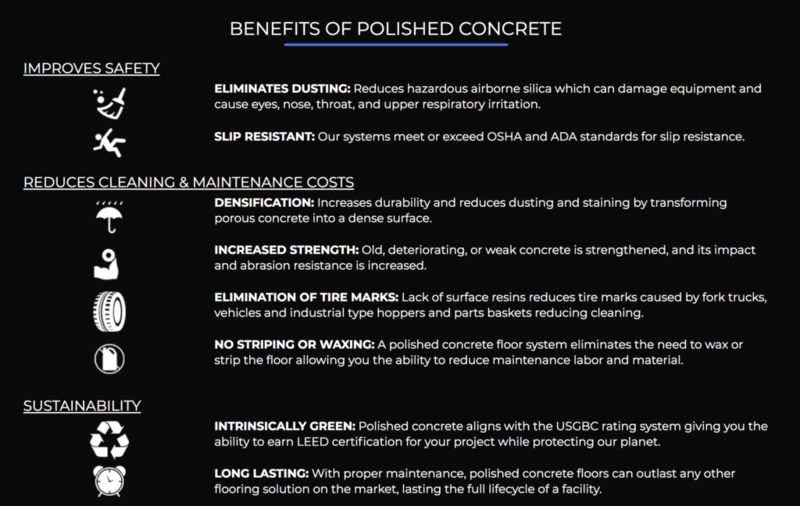 Not only is polished concrete competitive with other floor systems such as epoxy coatings, tile and carpet, but it eliminates a wide variety of other expenses. A polished concrete floor immediately reduces tire wear, daily maintenance expenses, cleaning expenses, even lighting expenses. Polished floors require no sealers or waxes, eliminating these costs both now and in the future. Polished concrete floors will be there as long as the slab exists, whether that be forty or fifty years later. Polished concrete needs no sealers or waxes. These treatments need to be removed and reapplied periodically and often increase the floors tendency to retain contaminants. Simple periodic burnishing helps maintain the reflective nature of these floors and is quick and easy. Polished concrete floors eliminate the need to strip and wax your floors, while also eliminating the cost of labor or materials to do so. Aside from the occasional damp mopping, polished concrete floors will require very minimal maintenance. When polished and shined, polished floors can rival the look of marble, granite, or terrazzo. Concrete polishing creates aesthetically pleasing floors without any special treatments. In addition, polished concrete floors can be stained and modified in a variety of colors to make your floor meet your vision and style. They can be burnished to a high shine, can be dyed an assortment of colors, and can include many decorative options. Highly reflective floors increase overall light levels by reflecting upwards the light from ceiling fixtures. This saves you money not only on lighting cost, but helps reduce the load on air conditioning systems, as they do not have to remove as much heat generated by lighting. Studies have shown that polished concrete floors can decrease your electricity bill because they are highly reflective and require less light to brighten a room. Polished Concrete can save you time, as the work can be completed in sections with no drying time – reducing the inconvenience of having to cease operation or leave the facility. A HEPA filtration vacuum systems eliminates the need to cover most equipment and puts our customers back on the floor immediately after the process is complete. Access can be given to areas as we work and allows our customers to eliminate any significant down time. The hardened and densified nature of polished concrete floors reduces tire marks and much of the wear and tear on expensive moving equipment. They also have an improved level of friction relative to coatings that eliminate all open pores. This helps retain the natural non-slip nature of concrete and helps reduce slip and fall exposure whether wet or dry. Concrete polish meets OSHA safety standards. Concrete is a naturally green product. It uses no toxic chemicals, glues or adhesives, and doesn’t need to be replaced and disposed of in landfills. Since polishing only removes a thin layer of concrete and makes it virtually maintenance free for an average of 20 years, it’s the ultimate green floor system. Polished concrete floors make cleaning easier and less expensive. These floors effectively reduce the frequency, length of time, and expense of cleaning. Polished concrete floors do not trap mold, mildew, dust mites, bacteria, allergens, or moisture like other floors do. Because the floors are polished, they are not porous, meaning nothing can get inside. Please note pictures on our website are taken to show reflection from a low angle. These floors have imperfections like all concrete floors do. We recommend a demo area on your floor for approval so you will have an idea what your project will look like completed.